Set your sights on making a difference. 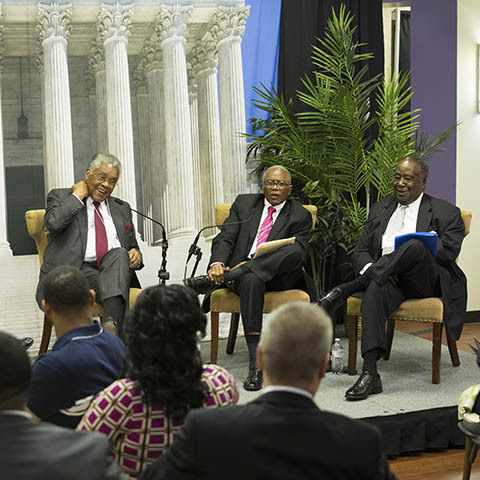 A part of the College of Leadership and Public Service, the Fred D. Gray Institute for Law, Justice & Society is based on the idea that legal change is one of the surest means to effect social change. Here, we consider America’s legal system from a multidisciplinary perspective to get a fuller understanding of its mechanisms, practice, and consequences. To prepare you for law school, social work, or dispute resolution, Lipscomb provides three major programs and one minor. Your studies will involve service learning and on-the-job training, domestic and international travel, and firsthand interaction with legislators, attorneys and judges. If your sights are set on making a difference, we’ll get you ready to do just that. We have the only program in the nation that incorporates travel to Washington, D.C. and London, England in our course curriculum. You'll also get hands-on learning experience through visits to Paris, Brussels, Geneva and the Hague, where you'll interact with the global community regarding major social and political issues. Ours is one of only a handful of programs with built-in service-learning classes, which means you will serve in the community while learning meaningful theoretical and practical lessons. All students in the LJS program earn the distinguished SALT Scholar designation at graduation. Your degree includes a required project surrounding a social cause of personal interest, designed to immerse you in the field before you graduate. The project is presented during your senior year to a panel of politicians, attorneys, and community advocates at the Law, Justice & Society Symposium.